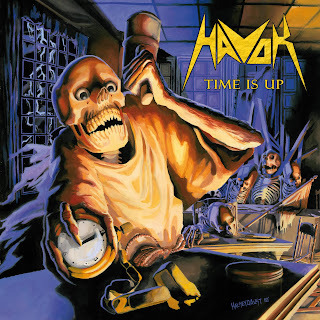 Havok's second album after the excellent 2009 debut provides more of the same. Time Is Up is filled with good quality new thrash, characterized by a hard edged mixing of controlled Megadeth and evolved Anthrax to produce a robust, modern sound. The pace is fast and faster, the delivery laser-accurate, and the attention span short: the durations are typically under 4:30 per track. Havok do throw in a couple of selections that add limited value to the album, and possibly detract from the package, but these can be attributed to trying for something new that doesn't quite work, rather than padding. On that flop side, No Amnesty steps over the line of sheer speed and becomes more frantic than useful, while The Cleric searches for a purpose and finds none. In contrast, the highlights are stunning. D.O.A demonstrates immense maturity by combining a controlled but break-neck pace with a sophisticated structure, a busy riff layered on top and glistening like rich icing. It does not seem possible, but D.O.A. climaxes by adding even more speed, and Havok somehow hold the steering wheel even as the needle goes past insane. Covering Fire is from the same mold, Pete Webber going nuts on the drum set while Sanchez and Scruggs trade deadly volleys of aggressive riffs and manic strumming. Opener Prepare For Attack is an incessant machine gun assault with a riff inspired by the best of Megadeth at full speed. The album ends with Time Is Up, the most Anthrax of the set, and also the most melodically playful selection. The toothy skullhead on the cover seems eager to knock out the clock, but before time is up, Havok deliver. Produced, Recorded and Engineered by David Sanchez. Mixed by Peter Rutcho. Mastered by James Murphy.